This two-year consultation considered the vocation of the theological faculty member, with particular emphasis on the pivotal choices and stages of development that shape the course of an individual’s career. The consultation sought to understand more fully the factors that contribute to fulfillment and productivity in teaching, research and institutional leadership by taking a longer term, developmental approach to the scholar’s sense of vocation. Since these factors are social as well as personal, the consultation placed personal motives and interests within the web of social relationships and institutional responsibilities that over time influence an individual’s vocation. 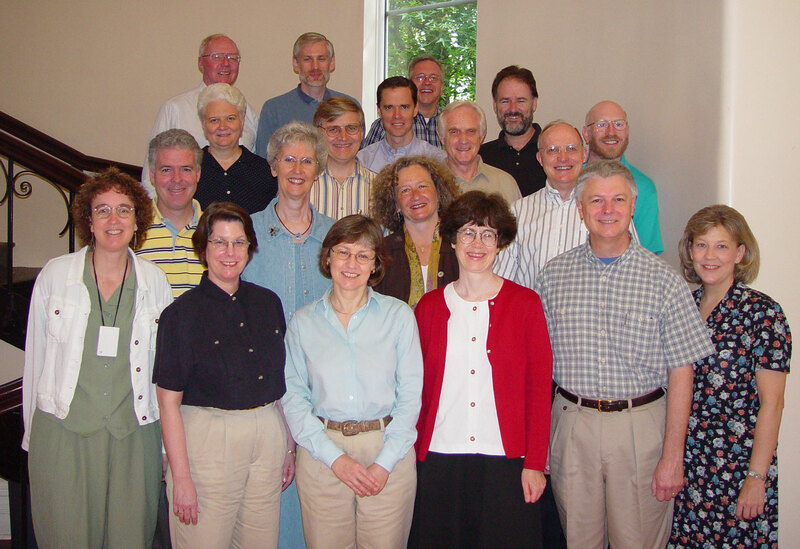 Front Row (left to right): Kathy Black (Claremont School of Theology), Sara Myers (Union Theological Seminary, NY), Phyllis Airhart (Emmanuel College of Victoria University), Katherine Hayes (Seminary of the Immaculate Conception), *W. Clark Gilpin (University of Chicago Divinity School), *Lucinda Huffaker (Wabash Center). Second Row: J. Michael Byron (St. Paul Seminary School of Divinity), Barbara Brown Zikmund (Doshisha University of Kyoto Japan), Gina Hens-Piazza (Jesuit School of Theology at Berkeley), *Raymond Williams (Wabash Center). Third Row: *Katarina Schuth (St. Paul Seminary School of Divinity), Philip Krey (Lutheran Theological Seminary at Philadelphia), Kevin Madigan (Harvard Divinity School), Don Browning (University of Chicago Divinity School), Robert Priest (Trinity Evangelical Divinity School), Thomas Massaro (Weston Jesuit School of Theology). Fourth Row: T. Howland Sanks (Jesuit School of Theology at Berkeley), Ron Anderson (Christian Theological Seminary), Kevin O’Neil (Washington Theological Union DC).